Note: When using Microsoft Active Directory for authentication, Kerberos keys are managed automatically. For other directory servers, it is necessary to import keytabs manually. A Kerberos keytab is a file which contains pairs of Kerberos principals and encrypted keys. By importing and using Kerberos keytabs, The Smoothwall services, such as authentication, can use the interoperability features provided by Kerberos. 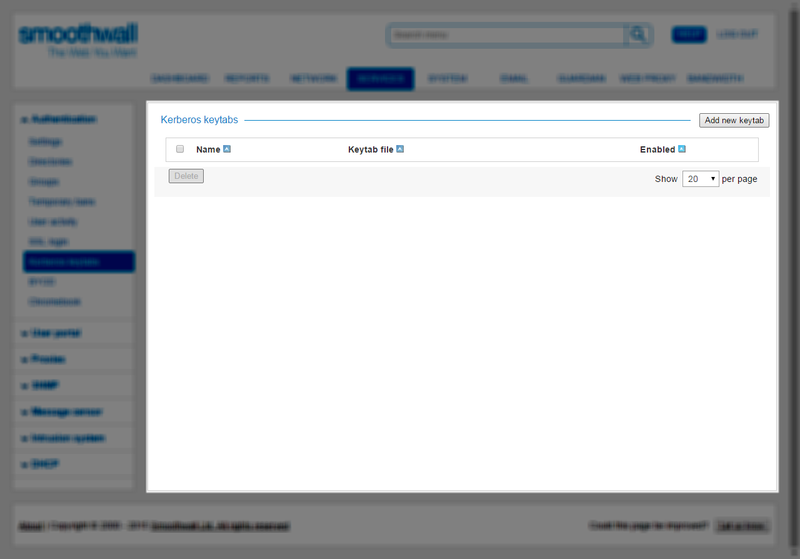 For information about generating keytabs, consult the documentation delivered with your directory server. Also, available at the time of writing, see http://technet.microsoft.com/en-us/library/cc753771%28v=WS.10%29.aspx which discusses how to get a keytab from Active Directory. For information about using Kerberos as the authentication method in authentication policies, see Creating Authentication Policies. 1. Go to the Services > Authentication > Kerberos keytabs page. • Status — New keytabs are enabled by default. Clear the check box to create a disabled keytab. • Name — Configure a meaningful name for the keytab. • File — Using your browser, locate and select the keytab. • Comment — Enter an optional description of the keytab. 3. Click Add. The Smoothwall adds the keytab and lists it in the Kerberos keytabs area. 4. Repeat the steps above for any other keytabs you need to import. Kerberos keytabs are enabled by default. It is possible to disable a Kerberos keytab when required, for example, when troubleshooting. 2. In the Installed Kerberos keytabs area, point to the keytab and select Edit. 3. In the Edit keytab dialog box, clear the Enabled option. Click Save changes to save the setting. The Smoothwall disables the keytab. 3. In the Edit keytab dialog box, click the keytab’s display arrow. The Smoothwall displays the content. 2. In the Installed Kerberos keytabs area, point to the keytab and select Delete. 3. When prompted to confirm the deletion, click Delete. The Smoothwall deletes the keytab.  Check if the user logged on before the keytab was created. Try logging off then on again. 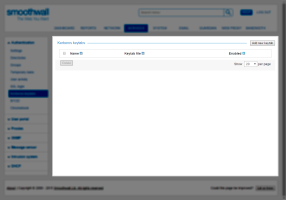  Check if the user logged on before the Smoothwall joined the domain. Try logging off then on again. • The keytab should contain SPNs containing the short and fully qualified forms of each hostname.